Thäter isn't something I've heard much about or tried before so I was curious to see why it was so highly regarded for softness. I usually prefer a brush along the size of a Duke 2, but after reading up on Thäter's knots and shapes, I thought I'd try the 24mm three-band Silvertip with a bulb shaped knot. I placed my order with the kind gents from Medina, Ohio and waited a few weeks for the 49125/1 to cross the Pacific. I test lathered it the other day and finally used it for my shave this morning. I started with a damp brush and worked my puck of Cade. It felt soft and a bit springy but it loaded soap quickly and copiously. Face lathering, I felt the brush to be a bit of a hog. I dipped the tips several times to build the coat and ended up with a thin but dense lather. Teething pains with a new brush, I guessed. For the second pass, I rinsed the brush and went back to the puck, this time keeping the tips a bit more wet. That did the trick and I was rewarded with a glorious cushiony layer of L'Occitane's finest. Shave concluded with the alum bar giving its seal of approval. Face feel is excellent. It doesn't feel huge at all. The bulb shape seems to make sure the brush stays in its lane. I've had a pair of fan knot brushes that would splay terribly wide if you so much as looked at them so I very much appreciated the Thäter's degree of control. Also, I'm glad I went with a 24mm knot. I have no doubt the size 0 would be equally impressive but for a guy who prefers smaller knots, I thought the size 1 was Goldilocks perfect. The tips live up to their legendary softness and until today, I had no idea what lathering with a cloud could mean. I used a few circular strokes early on and quickly shifted to painting motions. In both cases, I felt no scritch or pricks. Luxurious best describes the experience. My Simpson Best brushes feel like well-worn raw denim. This one feels like cashmere. Both are delightful but they do have their differences. Handle is the plexiglass version which is a pleasant departure from the solid color ones that my other brushes have. It's short but being used to a Duke 2 and Classic 1, I had no difficulty keeping a decent grip on it. It isn't a cheap brush but I believe it is worth every dollar if you seek a soft and pampering knot that can still work pucks. I'm happy with it and I thank guys like Giorgio, oversaturn, Claus and Celestino for recommending this brand to me. I am still a newbie (8 months wet shaving) and I am going through my experimentation with brushes. I own Thater, Simpson & M&F. While I can't yet pick a favorite, I will say that I reach for the Thater often and it certainly holds it's own with the big boys (Simpson & M&F). I am not educated enough to know detailed differences but I will agree the Thaters have the nicest face feel (I face lather). Love them. Congrats on picking a great brush. Seems I've been missing out on something stellar, must add one to the nook soon! Thäter is without a doubt one of the finest brush makers out there. Congrats on a great purchase! Congrats on a very beautiful brush! That is my favorite Thater handle, I love Plexiglass. It looks like it. I can't wait! Thanks! They must be a well kept secret. Shavemac and Simpson get a lot of deserved praise but I think Thäter deserves as much recognition. 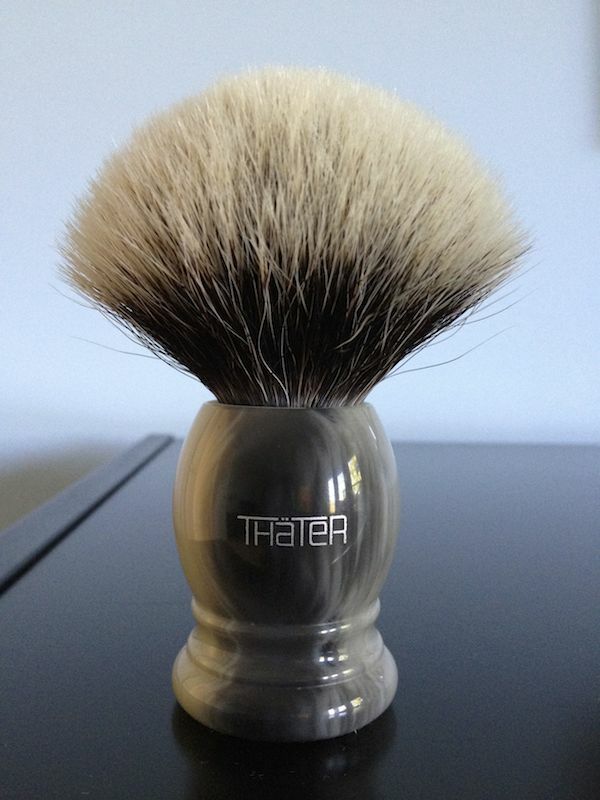 (10-18-2014, 11:22 AM)German Wrote: Thäter is without a doubt one of the finest brush makers out there. Congrats on a great purchase! (10-18-2014, 11:38 AM)TheMonk Wrote: Congrats on a very beautiful brush! That is my favorite Thater handle, I love Plexiglass. I sold my brush collection once I'd tasted Thäter. You ought to start saving up for a 2-band. 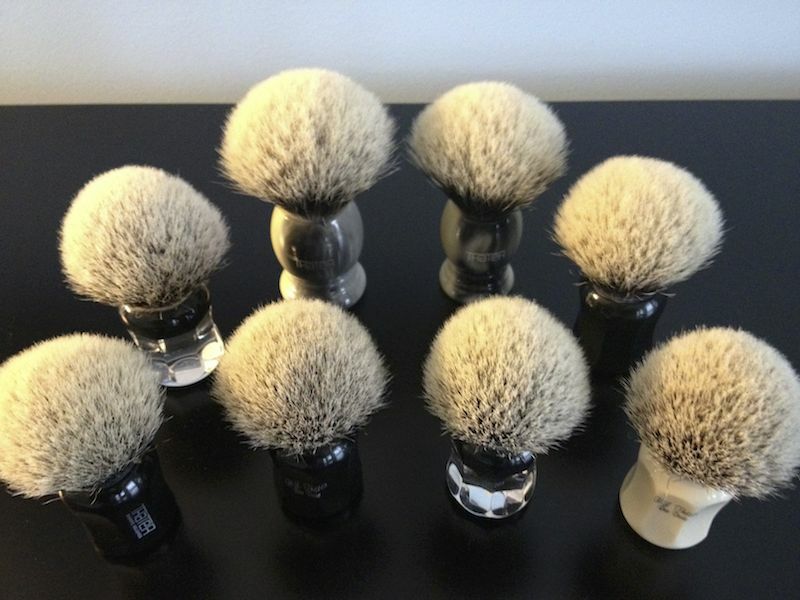 The USP of Thäter brushes is the softness of their tips. I can fully endorse this. 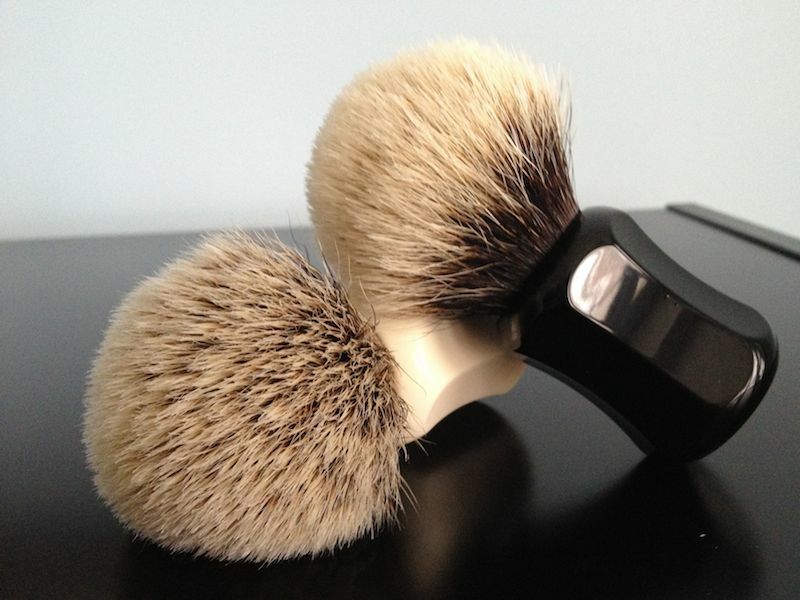 The 3-band is particularly soft - very noticeably softer than, say, the Shavemac silvertip grades - yet retains sufficient backbone to face lather pleasingly with. It lacks the density of the aforementioned, and therefore the backbone, but it's by no means 'floppy' (by comparison with the Kent BK silvertip line). I'd venture that the 3-band fan would be too far in that direction but the bulb clearly works. The 2-band provides a very different sensation to any badger hair grade I've tried. This is down to the softness of the tips. While the Semogue Finest had definite scritch and the M&F was a dense wall of unyielding 2-band, the Thäter is surprisingly soft with enough characteristic spring to remind you that it's 2-band hair after all. It all makes for a very luxurious package. I must admit that I can't compare these to the Simpson knots but then - despite having lived a short hop (100 miles) from the Isle of Man - I've bought both Thäters (origin: 800 miles away) and a Whipped Dog (origin: 4800 miles away) for travel for less cash than a Simpson CH2. Thäter is amongst the best brushes out there. Add the value factor vs for example Simpson and then they are a first pick. 3 band is wonderfully soft - the only consistently very soft 3 Band that I have encountered and I have tried Thäter brushes across various years. The 2 Band stands on it own - only rivaled by Simpson 2 Band - at a much higher price and spotty availability. I can highly recommend both bulbs and fans. However, suggest to take a fan always one size below a bulb due to splay. For me the sweet spot is a 24mm fan (size 1) and a 26mm bulb (size 2) in both 2 and 3 band badger. Some pics of current and past possessions below. Glad you are enjoying your Thater. I have three of them myself (one 3-band ST, and two 2-band STs). They are phenomenal. I like them better than my Shavemacs because the Thaters aren't quite as dense, thus having better flow-thru and softer feeling tips. 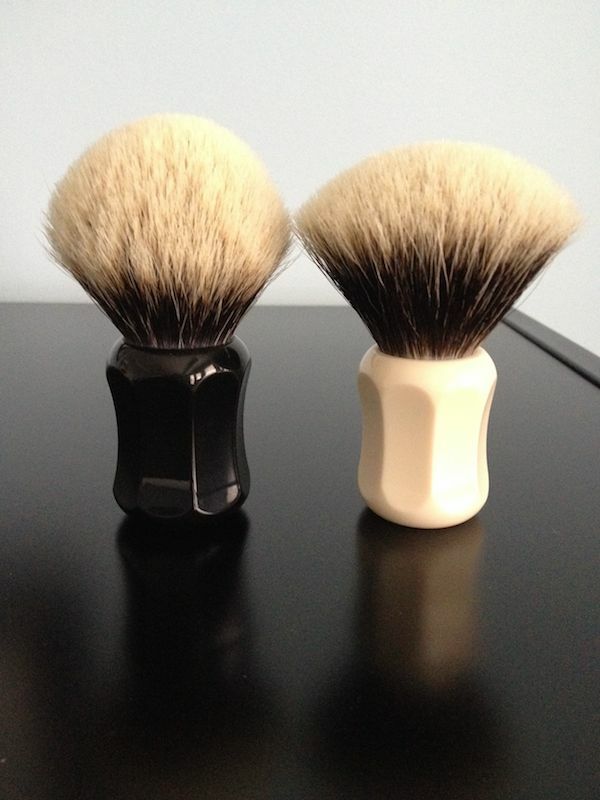 And they are head and shoulders above the three Simpson brushes that I had (sold them). It's interesting the difference in backbone between the 3-band and the 2-band; both great, and certainly noticeable. I prefer the bulbs of Thater. You've done well - enjoy! That's an impressive array you have there. That horn handle looks exquisite! It's strange. I'm fairly new to this adventure (about 2 years in) and when I had just stepped off the bus, the names I typically heard were Simpson and Shavemac for badger, Omega and Semogue for boar. Good brushes for sure but I'm suprised I didn't hear much about Thäter until I asked for recommendations for a brush that agreed with sensitive skin. I think anyone can certainly appreciate this marque even if they typically favor a dense knot on a daily basis. Variety does make life more interesting. German: very nice pix! I've got a 4125/0 and 4125/1 in 2-band; and a 4293/3 in 3-band (all bulbs) and love all three. Karlo: It does seem that Thater is currently taking a back seat, in terms of forum buzz, to the Simpsons and Shavemacs. But for me, Thater in no way takes a back seat in terms of performance; I really like them. The other fantastic brush brand that doesn't currently seem to be generating much buzz is Savile Row. When the SBAD monster starts nagging you again, that's the one to get, IMHO. But that's for another thread I suppose. Enjoy your new Thater. They are highly regarded amongst German wet-shavers, and you can see why. I have the same 49125/1 that you have and enjoy, and it is one of my favourite brushes. The softness of the tips is remarkable, and I can think only of a couple of other brushes that play in the same league in that specific parameter. I’m glad that I was able to help, and I sincerely hope that you’ll enjoy your brush as much as I enjoy mine, and for many years to come! 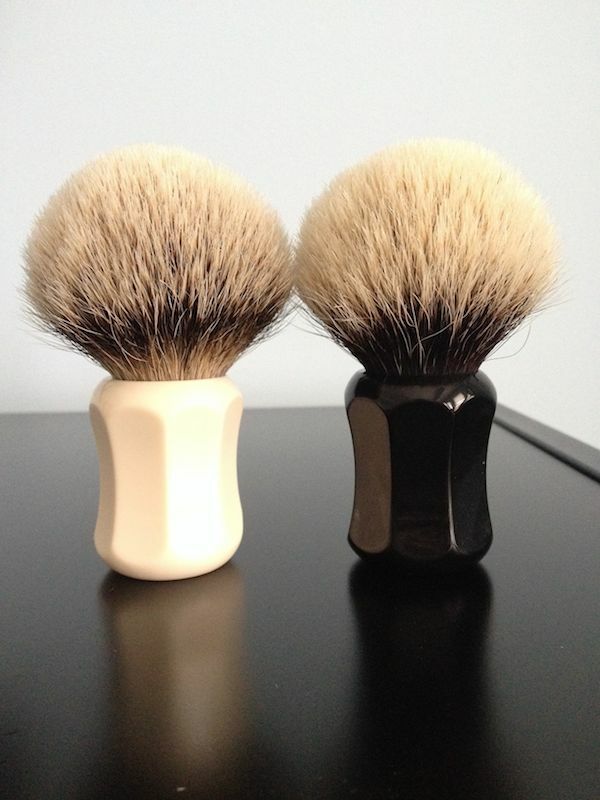 Karlo, great to hear you are enjoying a great brush! This is probably not going to be good for my credit card, but for those who have both the three and two band Thaters, how difference does the two band feel in softness and backbone? 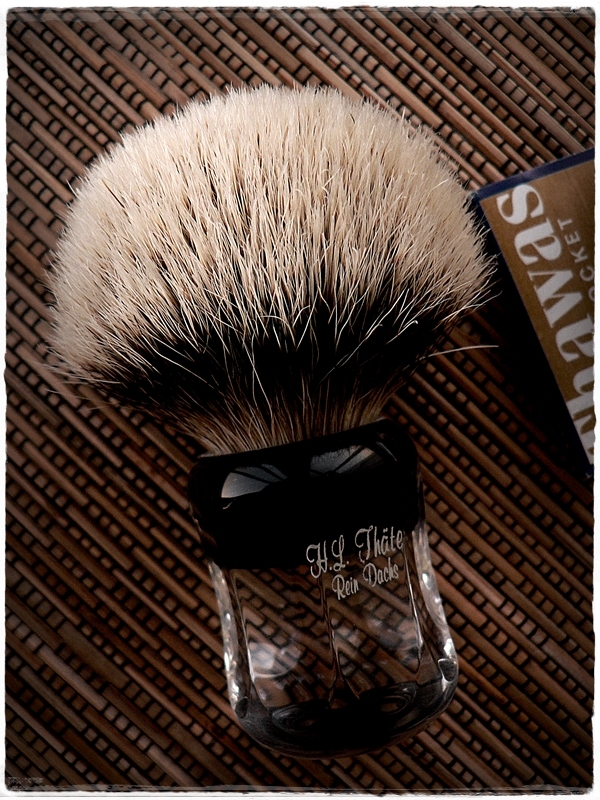 I have a shavemac 2 band Silvertip coming in December. (The new silvertip knot instead of the D01 2 band). I was hoping to get a comparison before deciding if I want to get a Thater 2 band for my birthday early next year. (10-20-2014, 11:02 PM)Karlo Wrote: This is probably not going to be good for my credit card, but for those who have both the three and two band Thaters, how difference does the two band feel in softness and backbone? I've got both Thater 3-band and 2-band, all in bulb. In terms of backbone, the difference is quite noticeable. I like both, but I think I prefer the 3-band. To me, the 3-band has enough backbone, and is more luxurious, if I can use that term. Both have incredibly soft tips. I also have a Shavemac new 2 band, but it's a fan, so not really apples-to-apples comparison. There's always much discussion about the grades, backbone, tips, splay, etc, but there's one thing that is consistent with Thater brushes - they're beautiful! To my mind, the best looking of the commercially available brushes. (10-21-2014, 05:36 AM)Gordy Wrote: There's always much discussion about the grades, backbone, tips, splay, etc, but there's one thing that is consistent with Thater brushes - they're beautiful! To my mind, the best looking of the commercially available brushes.